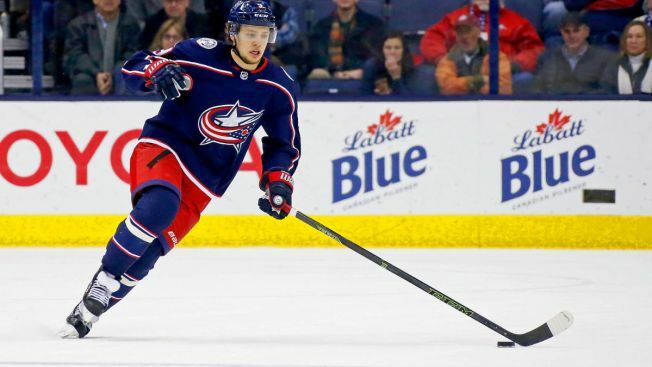 Josh Anderson scored in the third period, Sergei Bobrovsky stopped 31 shots and the Columbus Blue Jackets beat the Chicago Blackhawks 3-2 on Saturday night. Pierre-Luc Dubois had a goal and an assist for the Blue Jackets, who badly needed the two points as they fight to stay in contention for a wild card in the Eastern Conference. Cam Atkinson also scored. David Kampf and Tomas Jurco scored for last-place Chicago in the second leg of a back-to-back. Rookie Anton Forsberg had 26 saves against his former team. The Blackhawks had won two in a row and three of four. Chicago jumped in front when Kampf redirected a shot from Ryan Hartman for his third goal just 1:28 into the game. But Columbus tied with 2:08 left in the period when Atkinson sent a power-play shot from the top of the right circle over the shoulder of Forsberg, who was screened by Columbus' Alexander Wennberg. The teams exchanged goals again in the second. Chicago probably should have had more, hitting the post twice and failing to capitalize on a pair of power plays. Jurco got his first goal of the season at 9:20 with a wrist shot from the slot. Columbus tied it again at 14:30 when former Blackhawks forward Artemi Panarin picked off a Chicago pass in the neutral zone and carried it all the way back, delivering a perfect cross-ice pass for Dubois to shovel in. Anderson got the game-winner 7:14 into the third.